So when I made a solo visit to Ipoh in late December last year (http://perthmunchkin.com/2012/01/03/ipoh/) I made the comment that perhaps my visit would have been enhanced by the accompaniment of some seasoned Ipoh campaigners to provide me with some guidance. Luckily in my new place of employment there are several folks that could claim the tag of ‘regulars’ at this establishment. So the opportunity presented for me to make a highly anticipated return visit. Our crew of 5 wandered down, secured a table and I was then talked through some of the highlights of the Ipoh menu. 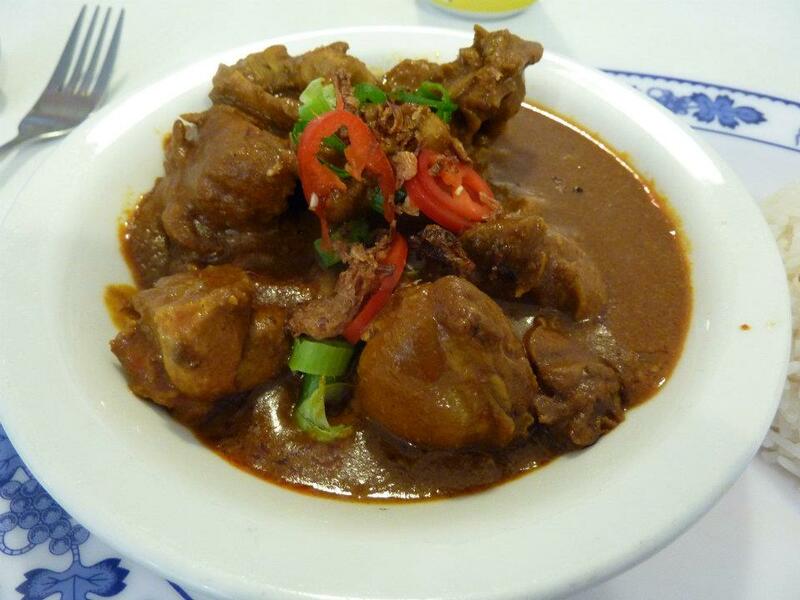 Clearly Beef Rendang (what I’d had previously) was a favourite with some, as was the “Number 4”, better known as Chicken Curry and Rice. Given that I’d had the Rendang last time I decided to sample the Number 4 on this visit. I was told that given the chicken came served on the bone there was an element of hard work in getting the chicken off, however most suggested it was worthwhile putting in the hard yards initially and then being able to just sit back and enjoy the magic of the meal. So soon enough our meals arrived and for the price I do think it’s a fairly generous serve. A decent mound of steamed rice and then a separate bowl full of the chicken curry and oodles of the thick gravy. The was also a liberal sprinkle of fresh red chili, which packed quite the punch. As noted previously….. I’m not really a chilli fiend and this curry had a fair bit of spice. I was grateful for my can of Solo. Hmm….. so on the basis of this meal would I race back? 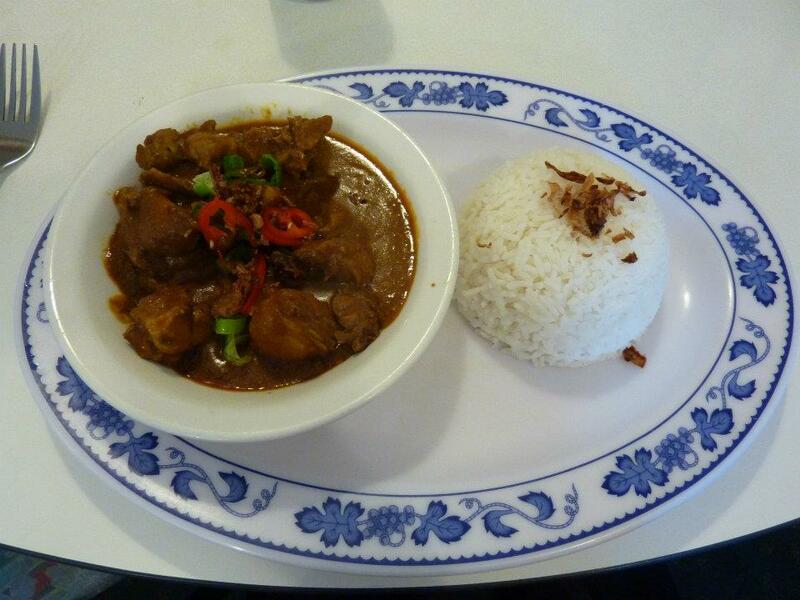 It was nice and I did prefer it to the Beef Rendang, which had let me down last time with some pretty average meat. The sauce was so full of flavour and was well matched with the rice……. One of life’s simple pleasures is good sauce and rice… or naan, but I digress. And the chicken, while initially fiddly, was well cooked and there was a decent amount of it and $10 for lunch is a good price but I just can’t bring myself to join the Ipoh faithful. The food is fine, its just not my favourite and at the end of the day I really like Hans Chilli Chicken Rice and it’s just a few extra steps down the road, so sorry fellas, but given the option…… I think I’ll take those few extra steps. Well C you just have to think that everyone has different tastes. I mean a prime example I am not the biggest fan off sizzler, yet when you drive past there on a friday or saturday night the queue is out the door!